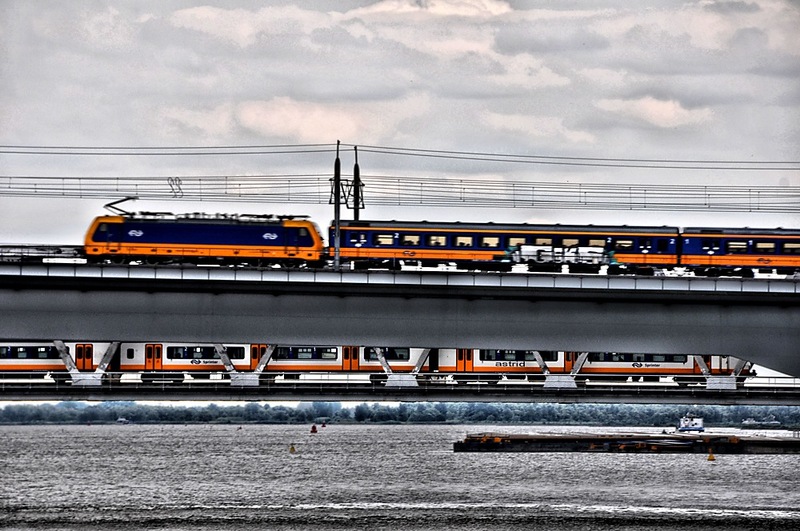 The Moerdijk-rail-bridges are important bridges for the High-Speed-trains between Amsterdam and Paris. Because of the speed the rails needs to be replaced at certain times. Now they are up to date again and ready to go. En effet, ils ont l'air d'aller vite. Picturit: We were lucky to just be there at the right time. It was a great view. Lots of water too. Love this Homage to Transport, Astrid. Picturit: Trains and boats are very very important in the Netherlands. We have an infrastructure that is pretty good. I love the lines in your photo... and the video was great fun! As I often say, leave it to the Dutch. This is so high-tech. Great timing, Astrid. As you know, I am a fan of these things..
Picturit: I know and this is amazing also how they built this many years ago. Some engineering indeed. Thank you, Chris. On croirait voir la vitesse ...Bravo pour ta photo ! Picturit: Thank you for your kind words, Claudine. Sometimes we get lucky. Have a great evening and weekend ahead of you. One day we will have HS2. This will be built destroying ancient woodlands and blighting many people's lives. But it will allow a few people to travel at high speed between London and Birmingham. Picturit: I know what you mean. We lost some land too and they had problems with making the tunnels water tight.... water was leaking in, They solved it now and it is a good connection, as a matter of fact, Ginnie and I and her sister and brother-in-law travelled this bridge to get to Paris last year. Good to see the Astrid express overtaking this conventional express. What a long expanse of water the railway has to cross. We are lucky to have this around. It goes without saying I like this, how lucky to get two trains at the same time. Picturit: .....and a boat... we were there at the right time. Lovely layers of trains. It reminds me of layered cake. Picturit: I love your imagination. Thank you Louis. Picturit: Thank you, Cherry. I love trains and this came as a surprise. The layering in this image is brilliant!